Catching the Overnight Sleeper Train to the Scottish Highlands And Inverness. It’s difficult to express the magic of traveling by sleeper train, hearing the night rush by as you snuggle down ready to wake up in an exciting new place. The UK has two sleeper trains: the Caledonian Sleeper from London to Scotland, and the Night Riviera, speeding from London to Penzance in Cornwall via Devon. Here’s my guide to the Caledonian Sleeper, a route to the Highlands and Lowlands that takes you on the night train to Scotland. Here you can find out more about how to take the overnight sleeper train, prices, times and how to get the best from the experience. This article was revised and updated in September 2018. The Lowland sleeper has two sections, one for Glasgow and one for Edinburgh. I remember as a child hearing the magical announcement, so exotic to my ears, that “the train will be divided at Carstairs with the front portion going forward to Edinburgh and the rear to Glasgow”. The sleeper train to Inverness, Aberdeen, Edinburgh and Glasgow consists of a lounge car, a car with reclining seats and space for baggage, plus up to six sleeping cars. There are just two sleeping cars to Fort William, which is probably a good reason to book earlier if this is your final destination. Passengers for Fort William can use the Aberdeen lounge car in the evening, and will find that a further lounge car and seated carriage are added in Edinburgh for the morning part of the journey onward to Fort William. If you’ve chosen to travel in a seat rather than a sleeper to Fort William, you’ll need to change carriages at Edinburgh. Don’t forget that taking the night train gives you extra bonus time at your destination. And it’s not just a Scottish (or Cornish) thing too. You can read more about taking a night train in Europe here, covering exciting ground between Zurich and Zagreb, Verona to Vienna and beyond. You can buy your tickets online here at the Caledonian Sleeper. You can use international cards for payment, and tickets can be printed from ticket machines at stations in the UK. You’ll need the card that you used to pay for your ticket to verify your identity, and an alphanumeric code which will be emailed to you. If you need to add dogs or bikes, the ticketing system is ready for this too. If you are traveling with a group or with family, sleeper compartments have connecting doors to the next compartment which can be opened up to give you a room for four people. You can now book for dates up to a year in advance. If you need to buy additional train tickets to cover extra services such as traveling to join the sleeper service from elsewhere in the UK, I’d advise you to buy them separately from one of the UK’s train operators. This is likely to give you the best discount opportunities. You can find out more at our guide to affordable public transport in the UK. Railcard holders get a 34% discount on most sleeper services, although this will change slightly when the new train services are introduced late in 2018 and 2019. You join the overnight sleeper train at London Euston from 2030 for the Highland route, with the train departing at 2115. The train then leaves Crewe just before midnight and Preston around 0100 before heading north of the border. Arrival at your destination time is varied, with early calls for Stirling and Gleneagles just after 0500, Dundee around 0600, Inverness at a very civilised 0830 and Fort William just before 1000. Services depart slightly earlier on Sunday night. If you’re heading to Glasgow and Edinburgh, the Lowland service boards at 2300 for a departure just before midnight, seeing you in either destination just after 0700. Your return sleepers from Scotland also enable you to board from 2000 for the Highland route and 2300 for the Lowland. It’s always worth checking for any engineering works, especially at weekends, as this may alter departure times. You’ll find details of any changes available online. If you’ve opted for the reclining seat option, you’ll find that the seat configuration is more like first class than standard, with two seats on one side of the carriage and one on the other. Seat passengers can use the buffet facilities in the lounge car, but not the lounge car itself. The seats themselves are airline style, with a drop down table. If you book a standard berth, then you’ll find your compartment by carriage and number. Each compartment consists of an upper and lower berth with a tiny ladder, some hanging space and a basin. Large pieces of luggage can be stowed elsewhere on the train, and I’d encourage you to take as little as possible into the compartment with you. There are toilet facilities at the end of each carriage. If you are traveling first class, then the sleeping compartment is yours alone. If you’ve booked as a group, you’ll find the interconnecting door between compartments unlocked. Passengers can use the lounge car, where you’ll find a good selection of meals and refreshments including haggis with neeps and tatties to get you in the mood for Scotland. I believe that officially the lounge car is for first class ticket holders at busy times, but in practice, there are plenty of standard class ticket holders there. Bear in mind that when moving around the train that the current corridors are very narrow. You need to pass fellow passengers at the ends of carriages. You can have breakfast either in the lounge car, or in your compartment where it will be delivered by your steward at the arranged time. If you are leaving the train early, for example at Crewe, this acts as a good additional wake up call. We took the overnight sleeper from London Euston to Inverness and back, joining and leaving the train at Crewe. 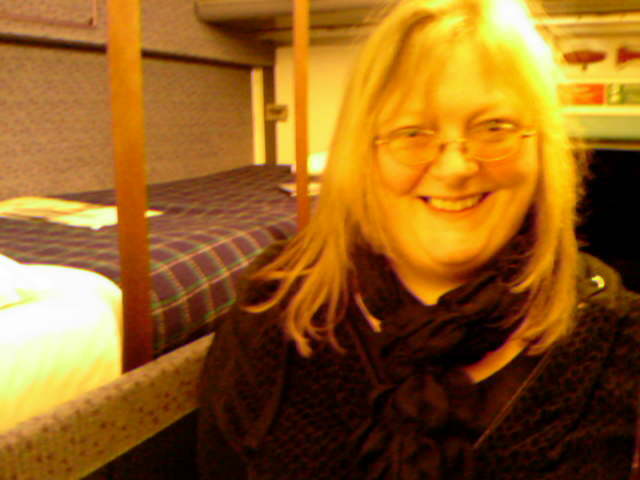 We shared a sleeper compartment with bunks and breakfast served to the compartment. While in Scotland, we hired a car and drove to Skye and the Black Isle, visited Culloden and Fort William and circled Loch Ness. Overnight sleeper services have been running between England and Scotland for more than 140 years. That’s a rich heritage, and it’s certainly a journey that deserves to be on anyone’s bucket list. We pick up the train at Crewe. It’s Valentine’s night, and we’ve been waiting in the hotel next to the station. There was a Valentine dinner, and all around the room, bored couples are toying with empty glasses. Balloons hang limply in the corners, and a few drooping roses are laid on the tables. But there’s an excited little gathering of people waiting for a train: not just any train, but the sleeper to Inverness and Fort William. In good time, we all make our way to the platform. Then she appears out of the mist, sadly neither chuffing nor steaming. Instead, she’s a throwback to the 1970s diesels that spanned the UK in my youth. We find our compartment via a welcoming steward and squeeze our bags into the tiny spaces. It’s not exactly a room for huntin’, shootin’ and fishin’ types, as you’d struggle to fit even a modest carp net under the bunks. Or indeed down the tight corridors, so pack light. We head off to the buffet car, where all but the most hardy passengers have long since called it a night. Perhaps it’s just as well we’re too late for haggis, neeps and tatties. It seems to be a night of parties we’ve just missed. Back in our tiny compartment, we try and work out how (and indeed how much) to undress in the wildly swaying confined space. We’re standing in a place probably about half the size of your average toilet cubicle, and trying not to flail our arms too much. We raise the blind, and end up sitting on the bottom bunk, watching lights flashing past and hearing the chattering of the rails. Making my way down the corridor, I catch a sudden glimpse of a vision in peach satin. I stand amazed as a passenger in a beautiful nightgown and wrap works her way down to the toilets. I glance down at the floor and wince as I see her beautiful peach satin slippers make contact with the damp patches by the carriage doors. She’s misplaced the Orient Express, and yet I am so charmed by her sense of occasion that I can’t think she’s being silly. This really is the stuff of which dreams are made. Back in the compartment, it’s difficult to sleep. Like a child, I’m way too excited. The bunks run across the width of the train, and every time we take a curve or some points I slide either to my head or my toes. I am in some hurtling version of Willy Wonka’s nut sorting machine. Yet the very motion and sense of speed is so exciting that I really don’t want to sleep and miss any part of the journey. Instead, we’re chatting quietly, watching the lights pass, and fascinated to see the progress of our journey north. Early in the morning, the steward knocks with a bag of breakfast goodies. We sit on the bottom bunk, marveling at the silhouettes of the Grampians and their big stark shadows. And as we eat, daylight fills in the contours and the hills come to life. By the time we reach Inverness, we are stunned at the sight of a troupe of hikers wandering the glens. In t shirts. In February. We really have entered a different universe. One of the most famous views in Scotland: a misty Eilean Donan castle. You can check out some of the best beaches we’ve visited in Scotland here. Our return trip to England took place mostly in the dark, as we made the journey in February. I’m thinking that taking the train in the summer, particularly June for the best of daylight, would be a magical experience. As we left the train at Crewe, we missed seeing dawn break, as would have been the case had we continued on to London. Consider joining the train at London Euston, rather than Crewe, even if you are beginning your trip in the Midlands. You’ll get more of the sleeper experience, and you might even get to enjoy the haggis, neeps and tatties en route. Pack something comfortable to sleep in, preferably something in which you can nip along the corridor to the toilets without either embarrassing yourself or freezing. It’s no fun trying to dress or undress in those little compartments, so do it as few times as possible. Pack as light as you can for the trip. Those train corridors are really narrow, and dragging a big bag behind you is difficult. Something fairly squidgy is also going to be easier to wrangle within the compartment space. You can leave a big bag with the steward. If you are staying over in Inverness or Fort William, see if the place where you are staying can hold your luggage until you board the sleeper. Had there not been a big event at our hotel on arrival, an early check in on arrival day would have given us the chance to shower and freshen up to maximise our time in Scotland. There are luggage lockers at the station at Inverness, and a left luggage facility at London Euston. Cheaper berth prices still exist on the Sleeper. If you are flexible with your choice of dates and can travel outside the peak season in June, then bargains are to be had. But if you want to head to Fort William, my advice is to book early, as there are only two sleeper cars on that part of the route. Or head to Inverness instead, hire a car, and make the drive to Fort William. Would I do it again? Very much yes! New trains are coming into service from October 2018 to early 2019 to replace current rolling stock. You can see a preview of the new accommodation here. Along with the new trains will come new ticketing and fare arrangements, reflecting the changes in facilities such as rooms with double beds, showers and toilets. There will still be classic rooms featuring berths and washbasins as exist now, and the reclining seat option remains. Allow me to tip my hat here to the decision to use a Scottish social enterprise to create the mattresses that we’ll be sleeping on for future Scotland trips. Changes will appear on the Lowland routes from October 2018, and on the Highland services from 2019. If you are booking well in advance, you may want to check with the train company to ensure that your preferred accommodation will be available. I love Scotland (even though I haven’t been yet) and sleeper trains! This looks like the perfect trip for us! Thanks for sharing these tips! It really was an experience. Even the lounge car on the train (not usually renowned for decor) had a bit of ambiance like a Scottish lodge. And Inverness and the Highlands are fabulous! Rent a car and drive around Loch Ness and over to Skye. We need to go back. Such a beautifully written post! Taking a night train is always an exciting experience. I have yet to take one with more spacious compartments (the first time I took a night train I was actually surprised by how small the rooms were). Aw thanks! I think we were amazed how exciting it was, rattling and bumping through the night, and waking up periodically to check what we could see. What a wonderful recount. I have never tried the experience of a sleeper train, but that’s somethingI would like to do. Sadly, on the overnight train journeys I’ve taken I had always chosed a seat, as it was the cheaper option. There is a sleeper train that takes you to northern Sweden that I would like to catch one day. Go to sleep and wake up in Lapland – definitely going to do this! I really like the experience that you share here. A few years ago I took the night train from Paris to Venice and this totally make sense, same struggles 😂 thanks for sharing! Paris to Venice sounds wonderful. I spend way too much time on the website of the Man In Seat 61, who shares such great vids and info about the big train journeys in Europe. Still plenty on my list to do. I love overnight trains! Of course I imagine this one would be a little more luxurious than the last one I did in Vietnam. Thanks for the information. I imagine the Vietnam train would be an amazing experience, although I might be a bit creaky for it now. Overnight trains are a great adventure. Ah, thank you! That hotel was brilliant – it was thick with the air of Valentine disappointment. 😉 And the feeling’s mutual – loving your blog too. I lived in the UK for a half year, but never left England, Im completely ashamed and sad. Id love to explore Scotland! If only I knew you could do it for only 45 pounds one way, Id go for it! Travelling and accomodation is so expensive in the UK! Thanks for the tip! Tis true that it can be expensive here. The other bargain, now sadly ended, was that you could buy a Megabus ticket to Edinburgh – but it sent you on the train. I think our most bargain journey was about £30 return each to Edinburgh from Birmingham. The sleeper’s a great experience, and tbh, I think you’d have just as good a sleep in the seats as in the bunks. Like me, you might be too excited to sleep anyway. Ooh yes! So much more fun than flying. Driving’s pretty epic too though (and it’s a long way for those of us used to a small island!). I went on my first overnight train in Thailand and it was actually very comfortable and a great experience! I would love to do this in Scotland! I’ve never been! Glad to know that the Thailand train is comfortable. My knees are getting a bit creaky now, and things like that are starting to make a difference. I’d love to try a big train journey outside Europe. I reckon that the big stations need something like a capsule hotel. Do the night train, then book a restorative three hour nap in a pod. That would see us travelers happy! Ashamed to say I never did Eurorail, but I’m fast heading to the age where I can get discounted travel again, so there’s always time! I love the romance of a train journey. But then I try to sleep and it all goes to hell. Lol. But I would love to do this since it saves me a hotel booking and I love all things Scotland. I think sleep would be possible on this one if you weren’t doing the imitation of a kid on Christmas Eve that I was managing. 🙂 We staggered through a good day in Inverness and at Culloden after the night on the sleeper, and were raring to go for roadtripping the Highlands the day after. Your writing style is absolutely captivating; I almost wish this post was chapters long. I even enjoyed your descriptions when you discuss the less-than-perfect return. I have always loved the idea of hopping on a sleeper train and waking up in a new place. Your blog title and the explanation in the header always makes me smile. That’s real adventuring. And it reminds me of my enduring love for Robinson Crusoe – read first as a child, and the ideas never went away. The little stories are the things that make travel. I am thinking that it was a Valentine trip or maybe an anniversary. I loved her style – I have a feeling I was in leggings and a fleece at the time, so hardly glamming it up! “You can leave a really big bag with the guard.” This is SO important! I love traveling light and it drives me nuts to take the train alongside tourists w/ oversized bags! LOL Very informative post! We only found that out later. After we’d played Bag Tetris in a very small space… So I thought it might be useful. (My Bag Tetris workout was very powerful though. It could start a fitness trend all of its own. 😉 ) It was the trip that started me packing light, so I’m a reformed character. You made that train journey come to life! I loved the bit about the woman in the nightgown. I have been on plenty of sleeper trains around Australia but I would never be able to describe it with such story and character as you have! Thank you, that’s lovely to hear. For me, the characters and the scenery are what make journeys. They are the memories that fill my travel journals. And sleepers in Australia? Wow! I’ve heard of the Ghan, but went off looking and see there are lots more. Through the Red Centre and the Nullabor would be incredible. I’ve only ever flown over, and that was amazing. At closer quarters would be stunning. Never took a train to Scotland but I drove Bristol-Scotland so many times. It’s always fun to catch a sleeper adventure though. And probably, packing light and having snacks seem like a very good idea! It’s a whole different experience isn’t it – all about the journey. I think if we’d joined the sleeper at Euston, we’d probably have been able to socialise on the way up. When you join at Crewe it’s pretty much midnight already and most people were tucked up. Warsaw to Moscow sounds incredible; I would definitely love to do that. I lived in Scotland for a short while and absolutely loved venturing into the Highlands! Such beautiful scenery. I had never heard of this sleeper train, so nice to learn more about it! Thanks for sharing your experience. We have the occasional “shall we?” moment about relocating to Scotland. It’s very tempting, although not feasible at the moment. You must have had a fabulous time living there. What a way to wake up in the morning the day after Valentine’s! I’m sure it must have been very memorable during this time of your life 🙂 Lovely writing style you have, Bernadette! Ah, thank you. We were on the train for my husband’s birthday, although in truth it was probably bucket list for both of us. Great memories, definitely! What a lovely post! I have never taken an overnight train, I know I would stuggle sleeping and then feel totally drained in the morning. However, I have taken an overnight coach in Vietnam and it was a horrendous experience, cockrouches running all over the place ugh, but that is another story. That’s a whole other level of adventure, and probably not one I’d be terribly good at. 😉 Sometimes adversity makes for great travelers’ tales, and sometimes it makes you want a long shower. I’ll certainly tuck that away for future reference! I hear that the buses in Brazil are great – an experience in their own right. We’re hoping to head that way in 2018/19, so maybe I’ll get to try that out. Scotland is most definitely recommended. Ah, thank you. It’s definitely a journey worth making; I’ve not done anything like it before or since. It wasn’t the most comfortable night I’ve ever had, but it’s certainly one of the most memorable. We went in February, so it was mostly spotting lights until Scotland, when we could start to see the scenery. I imagine it would be spectacular in June when you’d have lots of daylight for the journey. Love the poem and the way you describe the little details. My partner loves train journeys and this is definitely one I’ll do when visiting Scotland. It’s so very worth it. I don’t think I’ve had an experience like it before or since. Have never travelled in Europe at night, especially by trains. But sounds very exciting.Thanks for sharing. I think our next one may be mainland Europe. Unless we can run to Amtrak. I’ve got a yen for more of the great train journeys. I can’t believe how narrow the train doors are – thanks for the tips! Looks ridiculously cold and probably a place I’ll have to visit in the summer (body not made for these epic cold temps) haha. I think it’s a bit of a typically British weather experience. 😉 We went in February for my husband’s birthday and the Highlands/Inverness was actually pretty warm. There were people in t shirts walking into Inverness, and even chilly me managed in a fleece and top. As we got nearer to the Midlands, it was way more bracing. No rhyme nor reason to the weather here. But definitely go for it by summer; the views on the long summer nights would be stunning. This is a nice post, I really like your writing style. I have been on only one sleeper train, through the Australian Outback. They are an experience aren’t they! Thank you! I’m sure the train through the Outback was magnificent. That must be added to my ever-growing bucket list. I imagine all the colours of sunrise and sunset make for a spectacular view of the Red Centre. And yes, most definitely an adventure! It’s definitely worth adding to your list of things to do. I’ve not had another travel experience like it. Wow the Eilean Donan Castle looks beautiful. Actually everything around makes it look great! Didn’t know that was running for 140 years! That’s a long way back! Also isn’t seat61 great? You can know everything about trains!! It was spectacular all round in the Highlands. So very, very beautiful. As for Seat61, agreed! Methodical, detailed, painstaking: everything you could hope for from a travel website. I’ve always wanted to take a train, being from New York I’m just used to the subway and I definitely do not want to sleep on that. This was lovely! thank you for the write up. The subway’s most definitely not built for sleeping. 😉 But I’m resolved to do one of the Amtrak long distance runs at some stage…just need to decide which one. Hi Bernie, I love this post. I never knew about the sleeper to Scotland or to Devon – every day is a school day eh? And I adored the image of the lady in her satin slippers and wrap. How evocative. It’s a tremendous experience. In fact we enjoyed it so much that I’m exploring the options to do it all over again. 🙂 It would be lovely to think we might bump into the lady of the satin slippers next time. I’d love to ask her about her journey.